“I attended a course, organised by the Recovery College about understanding substance abuse and Mental Health. It makes me feel better about myself if I can attend and more so if I am able to participate. On this occasion I was able to. It also helps me feel more confident to continue and build on these experiences.” Stephen Murphy, Southside Rehabilitation Association (SRA). The eight courses I have done at the Recovery College, as well as support from Carers Hub Lambeth (including a 10-week personal development course through City Lit) have been invaluable.” Joanna, carer and peer supporter. SLaM Recovery College has been in operation since January 2014, following two successful pilot terms in 2013. 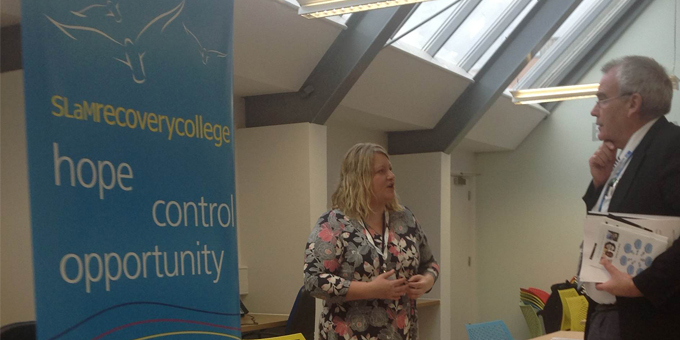 Manager Kirsty Giles gives an overview of a centre that is offering hope, control and opportunity. The college offers free workshops to users of SLaM services, their carers/supporters and SLaM staff members, which are jointly developed and taught by two trainers – one who has expertise through lived experience as a service user and/or carer and the other who is an expert by profession or job role. Everyone who attends the Recovery College is called a student rather than a service user, carer or staff member. You can say as much or as little about what brings you to the college. The college staff aim to provide a safe learning environment where people can learn from each other’s experiences about mental health and wellbeing. The Recovery College is an educational setting that compliments the clinical services provided by SLaM. The trainers can’t provide students with therapy or treatment, but knowledge and skills to support a recovery process or journey and can signpost to where clinical services can provide support. The student group is made up of 70% service users, 17% staff and 13% supporters, so there is always a diverse mix of people in the room, both to learn from and to share your experiences with. SLaM Recovery College has provided flexible working opportunities for people with lived experience to co-produce workshops. During 2014, seven people with lived experience were employed by SLaM to work in the Recovery College in a number of roles including administration and as peer recovery trainers. The demand for course places has been very high which has lead to a further five peer recovery trainers being recruited into contracted SLaM jobs. The Spring/Summer SLaM Recovery College term starts on 20 April and runs until 10 July. The prospectus and timetable will be available from mid March 2015. Kirsty Giles is pictured above at a recent Open Event at the Living Well Partnership. The Recovery College is just one of the many organisations and resources that you can tap into at the Living Well Network’s regular event held on the last Thursday of the month at 65 Effra Road, Brixton, 11am – 12.30pm.